You’ve read the countless articles on why your business needs to evolve. But have you read any on why your office space should evolve as well? Your office is the physical presence of your company. It shapes your visitors’ first impressions and influences your employees’ moods and productivity. If you renovate correctly, it can benefit both your business and your staff. Let’s look at a few reasons why, and how you can make your office makeover work. The first and most obvious benefit is employee satisfaction. A new office look and layout is exciting. Plus, a carefully planned renovation can transform your tired office space into a comfortable new working environment that elevates morale, renews motivation, and boosts productivity. An office renovation sends a message, loud and clear, that your company’s brand and image matter. It tells prospective clients that you care about your business, it’s growth and financial standing. You want that first impression to give clients and employees that feel-good feeling that your space is equipped with everything needed to feed creative ideas and rock that next project. Your company’s culture says a lot about who you are. Are you analytical or creative? Fun or formal? Maybe a little of each? Your new office space should reflect that. Outfitting your new office space in a way that nurtures your culture can have a profound influence on your employees’ enthusiasm. As time passes, offices typically accumulate clutter and get rearranged to accommodate furniture and objects instead of human ergonomics and work processes. An office redo is a perfect time to rethink the entire layout of your office based on the efficient interaction between departments and staff. 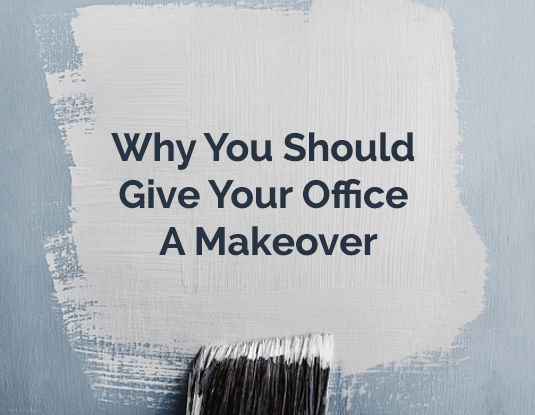 Keep in mind that you’re not merely remodeling your office. You’re also investing in the future of your space or building. So, consider wear and tear when hiring construction, maintenance, and cleaning crews. Ask them to rid your space of any harmful or environmentally unfriendly substances. Finally, renovating your office can save you money in the long run, provided you do it the right way. Choose ergonomic design features, sustainable construction materials, and, if possible, renewable energy sources. You’ll do the right thing while lowering your office upkeep costs. If your office space is in need of a makeover, we hope these tips point you in the right direction to achieve that amazing office space your business deserves.